The show may only have two central characters and 7 minutes (give or take) to draw you in but it does so with little effort. The humor and characters just naturally come appealing. Aside from Rumi's narration and disapproval to Seki's antics it mostly revolves around Seki's activities at his desk. It is actually great pacing and timing in which the comedy comes at you. It doesn't need to be blatant or outlandish. It's almost something akin to Tom and Jerry relying mostly on music and visual comedy for its laughs. Rumi constantly being drawn into his actions lends to the comedy as well. This season, this is the show I wait for the most each week. It doesn't need flash or a grand budget to be great, let alone time. It has you on the edge of your seat wondering what Seki is up to much like Rumi, and much like Rumi you revel in every moment of it. "The Master Of Killing Time" truly lives up to it's name. The animation is subtle, the comedy is golden, and there isn't a hint of any anime cliche's whatsoever. It reminds me a lot of the American Show "Phineas and Ferb", about two guys who do and build the craziest things over summer vacation, yet never get caught; not even by their sister who watches everything happen. So yeah, you could say this is the unique Japanese twist of "Phineas and Ferb", but definitely not a rip-off. I thoroughly enjoyed this anime series because of how creative and gifted Seki-kun is, despite the little effort he puts into school. There are always new and creative ways he's killing time in class, and it captivates the viewer instantly. In conclusion, this is a great anime and you won't be bored to death with extremely long episodes or little plot development. An anime that people of all ages can enjoy! Watching Seki kill his time is the perfect way to kill mine. So like, were you ever sitting in class trying to focus while a friend was sitting next to you goofing off and it was seriously keeping you from focusing? Well, that’s basically what this show is about. It follows a boy (Seki) and a girl (Yokoi). 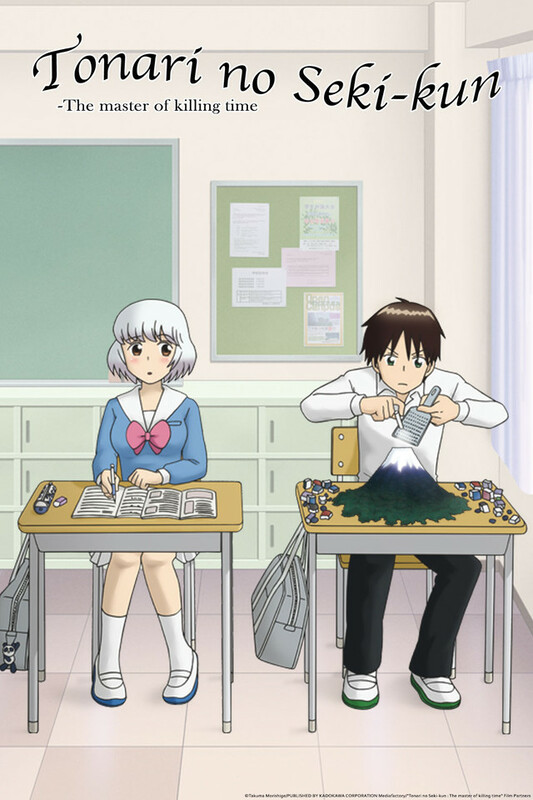 Yokoi is always trying to focus in class when Seki does something horribly distracting and Yokoi, as hard as she trys not to, basically finds herself completely distracted. While the theme of the show is rather simple, it never gets boring. The things Seki comes up with to kill some time is absolutely hilarious. While Yokoi does spend a lot of time trying to get Seki to stop so she could focus, she sometimes finds her self so sucked into what hes doing. In-fact, so sucked in that she finds herself playing along lol. The episodes are roughly 7 minutes long and I spend almost all of that time laughing. It's a perfect show to simply relax and unwind with. IT is a super cute anime, but it won't leave you sitting there wanting to through up, even though his little extraction's are extravagant, they are only toped by her reactions to them. it is short to keep your interest yet long enough to convey the story. Highly enjoyable 7 minutes well spent! You are led down a road of curiosity by the chick who is cannot believe her eyes at what the kid next to her is doing during class. In doing so, she adds story to each element and uses her own imagination as if she becomes part of the curiousity. Specifically there is a robot family also... with their own theme song. It is purely imagination that drives these short 7 minute stories, and almost all with some level of practicality... as if we could do this ourselves if our imaginations and patience would allow. I looked up Tonari no Seki-kun as a passing recommendation from a friend & have fallen in love with the series. For those who are current in school (or have moved beyond that), you can totally relate to this series as you may have, at one time or another, done something in class just to kill time instead of studying. Seki here kicks it up a notch to the ridiculous (& potentially ludicrous) proportions, all while dragging in a nearby classmate reluctantly who's trying to pay attention. While the episodes are pretty short, roughly 10 minutes or less, it's good for a quick view or something lighthearted to cleanse your pallet after watching something heavier (or disturbing). It's simple, yet intriguing enough to keep you coming back for more. You can't help but wonder what will Seki do next! I have to give it 5 stars as I can't recommend this show enough! It's a must-watch series! This show is cute, funny, clever and outrageous. Some of the pranks Seki pulls out just to kill time in class are kind of ridiculous but the best part is how sucked into it Yokoi always gets. Pure episodic 7 minutes of entertainment. This show shouldn't be scrutinized because the episode lengths are perfect. Humour never seems forced or awkward and the shorter length makes everything feel fresh. Watch this if you feel like snickering like a small child, especially the episodes with the robot toys. This anime is thoroughly enjoyable from start to finish. The story follows a girl named Rumi and her classmate, Seki, as she tries to not get involved in his shenanigans. Right off the bat, the story sounds very old and overdone, but this anime is able to present it in a very fresh light. Each episode is only 7 minutes long, and each one follows one of Seki's antics. Both of the characters featured are a treat to watch, and both of them are extremely enjoyable in their own ways. The comedy from the show pretty much stems from them, and they succeed in making you laugh. I remember watching this show when my father walked in and decided to watch it with me. He is not a fan of anime at all, and yet, after that episode, he was insisting that I tell him when the next episode came out so he could watch it with me. Tonari no Seki-kun is definitely worth your time, especially if you're looking for a lighthearted comedy with enjoyable characters.